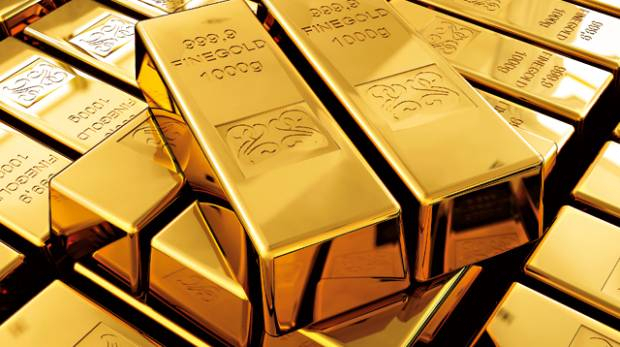 BENGALURU: Gold climbed to a more than five-week high on Tuesday as the dollar sagged after the United States and China agreed on a 90-day pause to fresh trade tariffs, while palladium notched up a record high, putting it about $4 (Dh14.6) short of parity with bullion. Spot gold rose for the second straight session, up 0.7 per cent at $1,239.30 per ounce at 1103 GMT. Prices touched a peak of $1,241.10 earlier in the session, their highest since October 26. US gold futures were up 0.4 per cent at $1,244.80 per ounce. The dollar weakened against its major peers, pressured by a thaw in trade tensions between Washington and Beijing, making gold cheaper for holders of other currencies. “Primarily it is the weaker dollar that is providing assistance and that will be the key driver in the short term,” said Capital Economics analyst Ross Strachan. The temporary freeze on further hostilities in the trade war sparked a global rally in equity markets on Monday. Global trade tensions over the past few months have seen investors opt for the safety of the US currency rather than bullion, a traditional safe haven asset. “After the G20 summit, safe haven buying in the dollar index has reduced [and] therefore gold is looking very strong,” said Vandana Bharti, assistant vice-president of commodity research, SMC Comtrade Ltd, adding $1,250 is the next target for bullion. Meanwhile, palladium continued its strong run to gain about 2 per cent to $1,226.95 after scaling a record high of $1,235. The metal, used mainly used in emissions-reducing auto catalysts for vehicles, has gained about 48 per cent since mid-August. “The market is structurally in a significant deficit, so there are clearly concerns about that,” Capital Economics’ Strachan said, adding that he expects prices to drop significantly over the coming weeks. The metal’s 14-day relative strength index (RSI) was around 76. An RSI above 70 indicates a commodity is overbought and could lead to a price correction. “The high price premium on palladium is not justified in our opinion because car sales have been fairly weak on all key markets of late. What is more, US tariffs have been threatened on imports of cars and car parts from the European Union,” Commerzbank analysts said in a note. Spot silver jumped 1.3 per cent to $14.56 per ounce, while platinum dipped 0.7 per cent to $801.